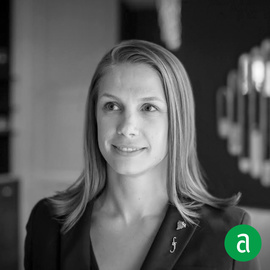 Jennifer Foucher, Head Sommelier at Fiola in Washington, D.C., shares her career timeline and advice for up-and-coming talent. "Don’t let your ego get in the way." Earlier in my career, I didn’t understand what this meant. I thought ego was about thinking that you were better than someone else, and since I didn’t feel that way at all, I struggled to appreciate this advice. What it means to me now is to never let the guest feel your judgement in any way. We need the guest in order to do anything. A large part of proper service means handling each situation with grace and poise no matter what happens. It was a valuable lesson. Working in a wine shop before I became a sommelier taught me so much and very quickly. I was lucky enough to work with a staff that had years of experience but also had patience for how green I was. When I worked at the Four Seasons in Toronto, I was 20 years old. I remember being both afraid and fascinated by every wine and each ingredient. I wanted to be able to speak confidently if a guest asked me anything. I studied, learned, and tasted for months until I felt secure. This curiosity helped me to move forward and discover what else was out there. Being able to relate to the guests who do not know much about wine is so much more important than talking about the small differences in vineyard sites and vintages. Most guests just want assistance in choosing something delicious and a large wine list can be very intimidating. Being approachable and easy to connect with is what appeals to everyone. It is important to have patience with guests who don’t yet know how to ask for what they want. You have to read between the lines. Words like “dry” and “spicy” have many different meanings and are some of the first words guests learn when speaking about wine. I think Binwise is one of the most essential tools in running a wine program. I have been so fortunate to have access to it in almost every one of my wine jobs, and I truly feel that it is indispensable. I appreciate a candidate who asks questions instead of talking about themselves. Enthusiasm and a vested interest in the job you are applying for says a lot about you. Someone who comes in and has a good idea about the history of the company makes a good impression. It’s important for the candidate to be knowledgeable and experienced but also to realize that there is so much more to learn. If the person I am interviewing shows off, I will wonder what they will be like with the guest. I think you can tell a lot about someone from that initial interaction. I try to read as much as I can about the industry in general, not just about the wine world. I enjoy learning about new restaurant openings, and I love to read wine lists. You can learn so much by following along with what everyone else is doing all over the country. It reminds me of wines I have forgotten about or introduces me to something new. There are so many different types of publications out there. I read Wine Spectator, but I also read Punch. Each one has something to offer that I value. Whether I am traveling abroad or having coffee in my own city, when someone adds to my experience by taking an interest in the way I feel, I am inspired. We can stop to think about what we can do to enhance the guest’s experience not just with the products we offer but with focusing on the way that they feel. During line-up, I encourage the staff to share experiences they have had in other restaurants. Remembering to "be the guest" once in awhile helps us relate to our own guests. How does it feel when the staff isn’t courteous, your food or drink takes too long, or you don’t like your table? It also brings up conversations about product knowledge and problem solving. I believe it helps keep us sharp and reminds us to never forget how the guest feels.